BOSTON, MA, MARCH 6, 2019 – CenturyLink, AT&T, Verizon, Windstream and Frontier have gained a position on the 2018 U.S. Incumbent Carrier Ethernet LEADERBOARD, according to Vertical Systems Group’s latest research. The Incumbent Carrier LEADERBOARD, which ranks incumbents in order based on U.S. retail Ethernet port share for this segment, is an industry benchmark for measuring Ethernet market presence. To qualify for the 2018 U.S. Incumbent Carrier Ethernet LEADERBOARD, companies must have either a top rank or a Challenge Tier citation on the 2018 U.S. Carrier Ethernet LEADERBOARD. 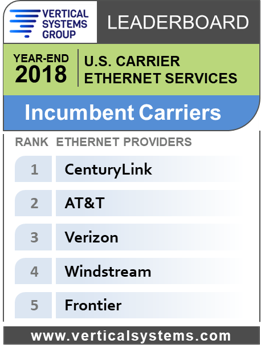 CenturyLink, AT&T, Verizon and Windstream each hold a top rank on the 2018 U.S. Carrier Ethernet LEADERBOARD. Frontier has a Challenge Tier citation for 2018. The Incumbent Carrier segment accounted for more than half of the 1.1+ million retail Ethernet customer ports installed in the U.S. at the end of 2018. Incumbent Carrier is one of three U.S. provider segments, along with the Competitive Provider and Cable MSO segments. Incumbent Carriers are facilities-based telecom companies, including IXC and LEC providers. Other companies in the Incumbent Carrier segment selling retail Ethernet services in the U.S. market include the following (in alphabetical order): Alaska Communications, Cincinnati Bell, TDS Telecom and other local and regional incumbents. Research sources for share calculations include Vertical Systems Group’s base of enterprise installations, plus direct input from biannual surveys of network operators selling Ethernet network services. Detailed Ethernet share results that power the Year-End 2018 U.S. Ethernet Segment LEADERBOARDs are available now exclusively through Vertical Systems Group’s ENS Research Programs. For more information Contact us.